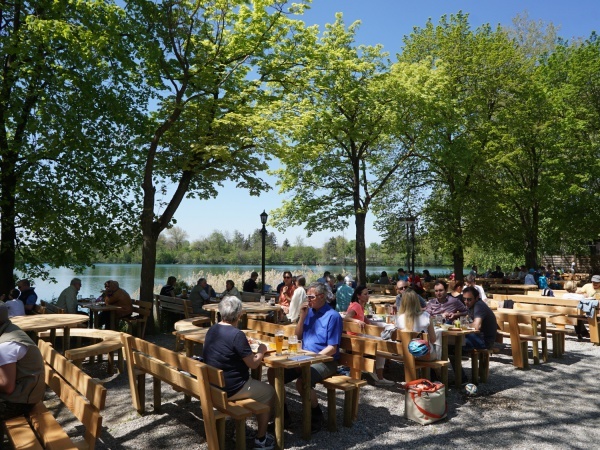 As the name indicates, Langwieder See beer garden is located on the shore of Langwieder See. The lake is a popular destination for cyclists and hikers. Due to its proximity of the Autobahn, a couple of hundred metres from the exit between Munich and Stuttgart, Langwieder See is also popular amongst day visitors coming from and around Munich for a quick day break. The beer garden has about 1,000 seats. Tables and beer benches in the self-serviced area are fixed to the ground. The best tables are under chestnut trees just by the lakefront. The remaining area of the beer garden is shaded by large yellow sun umbrellas. A Maß König Ludwig Hell (lager) costs €6.80 (May 2016). On Sundays there are live bands. There is also a hotel and restaurant connected with the beer garden. Depending on the weather, the beer garden is open daily from from March until October from 11am until latest 10pm.